Provided photo Star Chapter Award recipients were, left to right, Liza Bair, Kylie Blair, Samuel Sutherly, Emma Sutherly, and Maci Krites. In 2018, the chapter was ranked in the Top 10 out of 315 chapters in the state in the National Chapter Application. The chapter also placed in the Top 10 Chapter in the areas of Growing Leaders, Strengthening Agriculture, and Building Communities. At the 2018 National FFA Convention the chapter was recognized as a 3-Star National Chapter at the 2018 National FFA Convention. Additionally, the chapter was a Top 10 Chapter in the Nation in the area of Growing Leaders for our Little Library Program. Again in 2019, the chapter was named a Top 10 Chapter in the state and a Top 10 in all three areas of the National Chapter Application. The chapter will be interviewed at the 2019 State FFA Convention to be named the #1 chapter in the state. FFA members are given the opportunity to earn four degrees during their membership in the organization. The first is the Greenhand Degree represented by a bronze pin. Students were recognized who have reached the second degree presented – the Chapter FFA Degree. Twenty-eight candidates met the minimum qualifications for this degree: Natalie Bair, Erin Baker, Arielle Barnes, Adam Bensman, Jeffrey Blackford, Sarah Blocher, Makayla Brittain, Anna Broerman, Libby Carpenter, Abigail Covault, Coleman Demmitt, Carter Gilbert, Justin Hawkins, Cole Mergler, Morgan Nosker, Paige Pence, Meadow Powers, Grace Slone, Jimmy Sutherly, Jacob Sweitzer, Ethin Swindell, Caleb Taylor, CJ VanPelt, Leann Vernon, Isabella Waite, Seth Wells, Jarrett Winner, and Lauren Wright. One of the premier goals of the FFA is to promote leadership among its students. The Miami East-MVCTC FFA Chapter would not be able to do special projects without some very special people. There was one individual recognized with the Honorary Chapter FFA Degree because of their continuous support of the FFA – Schirbyz Party Rental, owners Kenny and Jenni Kirby. Proficiency awards are designed to recognize the efforts of members who have outstanding Supervised Agricultural Experience programs and have kept accurate records. 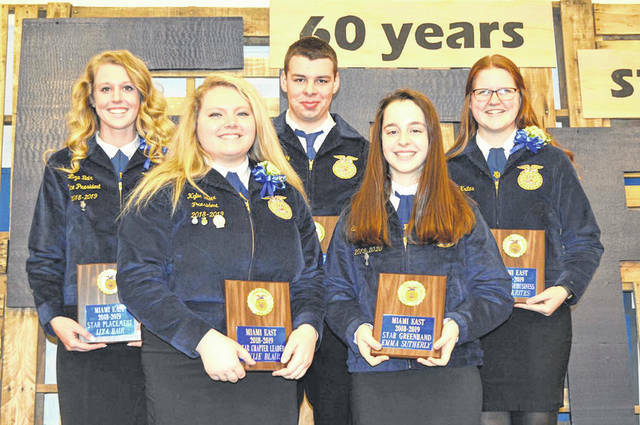 Winners of the 2019 Chapter Proficiency Awards were: Agricultural Mechanics Design and Fabrication – Maci Krites, Agricultural Sales–Entrepreneurship – Arielle Barnes, Agricultural Sales–Placement – Kylie Blair, Beef Production–Entrepreneurship – Elizabeth Bair, Beef Production–Placement – Lucas Gilliland, Dairy Production–Placement – Michael Bair, Diversified Livestock Production–Michael Bair, Poultry Production – Michael Bair, Small Animal Care and Production – Zach Kronenberger, Specialty Animal Production – Isabella Waite, Specialty Crop – Lauren Wright, Swine Production – Jarrett Winner. Quality Supervised Agriculture Experience Programs are based on accurate record keeping and perfected record books. Students with outstanding record books in each of the classes were Freshman – Gretchen Stevens, Sophomore – Leann Vernon, Junior – Elizabeth Bair, and Senior – Tyler Heckman. High scholastics are an important part of each high school student’s life. Results of the students with the highest academic records in their entire high school career include Agriculture, Food, & Natural Resources – Emma Sutherly, Plant and Animal Science – Libby Carpenter, Business Management–Junior – Kearsten Kirby, and Livestock Science-Senior – Maci Krites. Liza Bair, Ethin Bendickson, Kylie Blair, Kaitlyn Hawes, Kearsten Kirby, Paige Pence, and Jarrett Winner were recognized for selling over $1,000.00 worth of fruit during the chapter’s fruit sales. Jarrett Winner was the highest selling fruit sales person. The American FFA Degree is the highest degree for a member to receive in the National FFA Organization. This degree will be bestowed upon graduates at the upcoming National FFA Convention. Carly Gump, Dylan Hahn, and Alex Isbrandt will receive their degree in October in Indianapolis. The State FFA Degree is the highest degree received in the state. About 2 percent of the state’s FFA membership earns their State Degree. Liza Bair, Michael Bair, Ethin Bendickson, Kaitlyn Hawes, Savannah Holzen, Lucas Gilliland, and Kearsten Kirby were recognized. Additional Chapter Awards were Star Greenhand to Emma Sutherly and Samuel Sutherly, Star Chapter in Agribusiness was Maci Krites, Star Placement was Liza Bair, and the Star Chapter Leader was Kylie Blair. The 2019-20 Miami East-MVCTC FFA Chapter Officers were installed: Chaplain – Samuel Sutherly, Sentinel – Adam Bensman, Reporter – Emma Sutherly, Student Advisor – Carter Gilbert, Treasurer – Michael Bair, Secretary – Kearsten Kirby, Vice President – Lauren Wright, and President – Ethin Bendickson. https://www.dailycall.com/wp-content/uploads/sites/30/2019/04/web1_2019-Star-Chapter-Award-Recipients.jpgProvided photo Star Chapter Award recipients were, left to right, Liza Bair, Kylie Blair, Samuel Sutherly, Emma Sutherly, and Maci Krites.